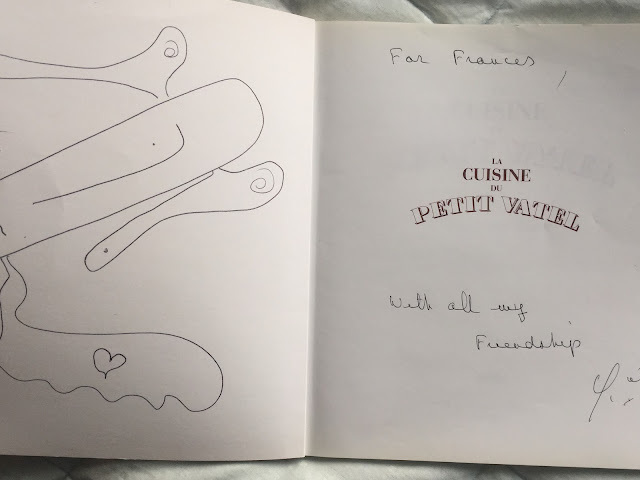 materfamilias writes: Travel Journal, Paris Pages. . . .
Travel Journal, Paris Pages. . . .
A few weeks ago, I shared some pages from my travel journal, pages written at a café in Paris, where I mused a bit about my progress with French. That journal entry was dated May 24th, the first full, jet-lagged day of our spring travels, and I'd like to share the rest of it with you this Monday morning. The entry continues my observations about travel in my second language, French, focussed this time on a visit to Le Petit Vatel, a restaurant my husband and I've been eating at for at least ten years now, through several owners. 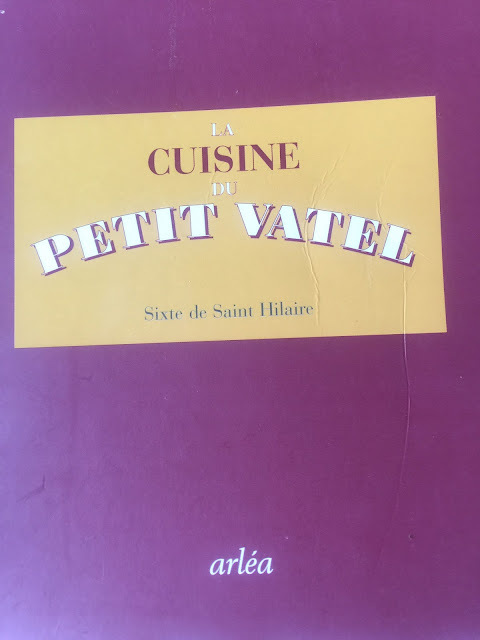 I wrote about it here, back in 2008, probably the same year that we bought a copy of the previous owner (Sixte de Saint Hilaire)'s book, La Cuisine de Petit Vatel. In fact, I've just pored through my box of old journals, and I can see that we first ate here in 2006. Back then, I restricted my record of our days to a few "bullet-point" notes scribbled in my dayplanner back in the hotel after dinner. Apparently, we tried to stop in at Le Petit Vatel on our way back to the 13th arrondissement after a day that included a photography exhibit at the Hotel de Ville, some shopping at BHV, even some browsing the gorgeous yarns and sewing notions at La Droguerie in the 1st. Sadly, our timing was off, and Le Petit Vatel's doors weren't yet open when we strolled along Rue Lobineau. . . But we got back there the next evening, even though we'd stopped for late tea and beautiful pastries at Ladurée on Rue Royale. . . . As far as I can tell, we must have really enjoyed our meal, because my dayplanner notes show that we tried to go back there for lunch on our last Sunday there. Doors closed again. 2007's notes remind me not only that we ate at Le Petit Vatel our first night in town, but also tell me that I started with marinated anchovies, had a chicken tagine as my main, and an île flottante for dessert. Paul's starter was the terrine de maison, followed by roast pork, with chocolate cake for dessert. I'm surprised to see that even before the blog had me making notes about meals, I was already jotting down details from the menus. Finally, though, here's the entry from last May. . . Photos of my handwritten journal pages first, followed by my transcriptions for those who'd have trouble with my handwriting. 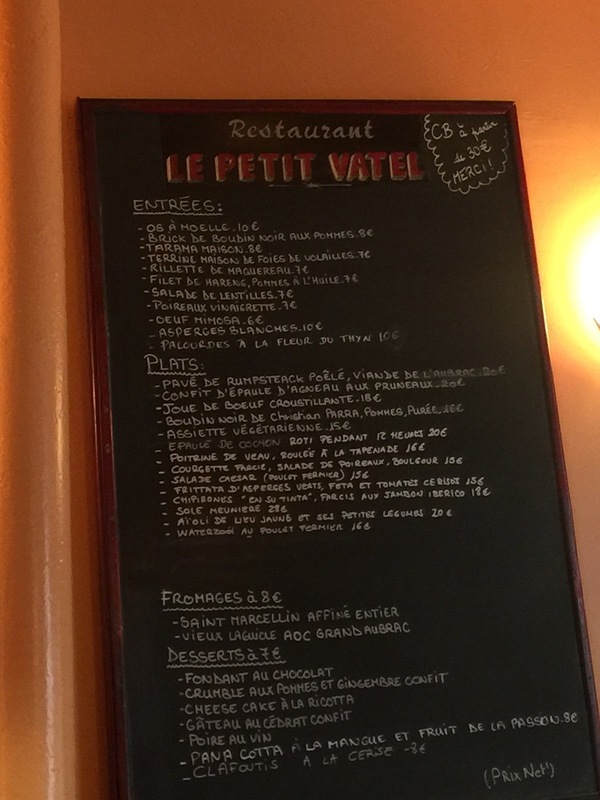 Another language moment -- we ate again at Le Petit Vatel. Have we probably eaten there 10 or 12 times over the years? Not often quite so early, but we planned an early bedtime after our travel day. We managed everything in French, as we can and do and there wasn't a moment when anyone offered English. A German couple came in shortly after us and where his French faltered -- What was Tarama? -- English became the go-between language -- fish eggs. . .
And then two American* women about our age, perhaps a bit younger, came in. Every caricature except the over Botox. Although to be fair, one woman was quiet, dressed in black and pearls (but large, costume I think, or just showy). The other, her hair stern but with a dramatic flap, dramatic highlights, brightly striped top, etc., asked loudly "Parlez-vous Englese?" Oh, so loud. So oblivious to everyone else in the tiny room. Then went through each menu item with the patient server, translating, then consulting with her friend, wanting to know if there were bones in the fish, etc. A bit later two young women, early 20s, first trip to Paris, speaking English that sounded Canadian to me, but only speaking at a moderated, across-the-table voice, worked their way through the menu items with curiosity and pleasure, checking for translation on their phone. I wanted to applaud, honestly. To be fair, the two older women settled in afterward, enjoyed their meal very much, complimented the server, etc. The Mastercard machine didn't work, and in chatting over the frustration, I said something about "beaucoup de défis," and she got me to repeat, then "Ah oui, beaucoup de défis" [many challenges]. Same with Paul, saying it was "gelée," the machine, frozen, blocked. And then she told us how "mignon" (cute) our accents were. Better head back to the hotel now for my second coffee and a croissant with Paul. . .
*In deciding to share this entry, I spent some time balancing my wish not to offend with my interest in articulating my observations, from my particular perspective. Please recognise that my identification of the women in the entry as "American" is not meant to generalise. However, there's no avoiding the fact that my journal reflects some obvious judgements on my part, judgements I might generally be more careful about sharing here on the blog. I wrote and deleted and rewrote and deleted a few paragraphs trying to analyse and articulate and justify that judgement. In the end, I decided to let my May travel journal pages speak for themselves and see what you think. . . The only thing I'd like to be clear on is that, while my journal entry for that day was clearly focussed on the pleasure I took in my growing competence in French, my judgement of the two women my age was not based on their lack of language skills, per se. . .
As usual, any relevant -- and civil -- comments are welcome. We could have a conversation about eating in another language/country. We could chat about restaurants you've visited over the years as you've returned to a favourite destination; we could speak of good and bad restaurant behaviour, home and abroad; we could talk about your cute accent. . . Ah, the possibilities! Gasp..clutches pearls...said this American! Insulted? Non! There are plenty of ugly Americans about but this faux pearl loving American is not offended. We eat out in many countries, what I hate....and that is not too strong a word, is rude, slap-dash, indiffernt or haughty service. Now that is what gets my knickers and faux pearls in a twist. And this was the place we encountered a horribly rude and condescending Canadian (!!!) couple questioning and criticizing the presence of onions in the prepared salads. We were embarrassed by association but got good mileage and many laughs from asking each other 'are there onions in this?' about everything we ate for some time afterward. Thinking back, that couple may have been related to those people you see standing on a corner, map or guidebook in hand, yelling at each other. Tired, and hungry, and lost, with an onion allergy. Yes, we Canadians can be every bit as rude, no question. And that aversion to onions reminds me of my father-in-law, who could be horrid to anyone who put them in his food (my poor mother-in-law resorted to every trick in the book to get the flavour in without any visible trace). Those are very happy memories, especially the owner willing to spend time making sure the teens were enjoying their visit. I might be fooling myself, but I do think our efforts to at least muddle through menus are appreciated. Although there's no question that sometimes the most efficient route is just to say it in English! I had to laugh out loud as I read your post. My husband is LOUD. It still amazes me that the size of the room or of his intended audience makes no difference in how loud his voice is. It used to drive me mad and embarrass my very WASPY self. I have come to appreciate this as part of his rumply, disheveled, very Italian charm. He tells me that as part of a very large family, one had to shout to be heard- a lesson he obviously learned well. Over the years I have found that his exuberance has one of two effects on people- he either draws people into his vortex or they run in horror! I can totally sympathize with your initial reaction to your overly loud (in manner and voice) dining partners. In truth my reaction might be similar. Hubby and I muddle along together- he draws me out of my preppy properness and I try to civilize him- each with only middling success! My Dad was exactly like this, and he embarrassed each and every one of us (my mother the most, thanks to her extreme shyness), but we also had an affectionate respect, even awe at times, for his exuberance. Until I read your comment, I hadn't made a connection between my reaction to those women and my memories of my dad, but there's probably something going on there. I was never quite sure how much my mother ever came to terms with my dad's loudness -- your approach sounds very wise, very loving. . . Loved this as it reminded me of the oversized personalities in my own large family. Interesting to think both lived/live in a second language: my uncle in German and my brother in French. Always fun to be around as both dove into the world around them with both feet, never disengaged. I like to eat close to wherever I live in Paris. My favourite place was a little crêperie downstairs fro my rue St. Jacques apartment. I had a salad almost every day as I reviewed for my afternoon class. The proprietor, Aurélie, became a friend but unfortunately she closed the restaurant a few years ago. As I travel and eat alone, I enjoy practising French/English or Spanish/English with restaurant servers. There's so much benefit to becoming a regular at a restaurant, even if it's for a relatively short period. But we've noticed the same phenomenon over the years -- favourite spots either close or they change hands. . . . Your facility with languages plus your willingness to travel alone means that you have many more opportunities to connect with locals and get a different perspective of the places you visit. I admire/envy this. I wonder if being loud & sometimes querulous is a result of feeling out of your depth ? On our travels in the US we met very few loud Americans . Most of them were very polite & charming even the very young . We Brits tend to murmur , apart from the drunk ones . You wouldn't want to be in a restaurant with them . What are the characteristics of a stereotypical Canadian do you think ? We're stereotyped as being overly polite, deferential, quickly apologetic, but I know more than a few exceptions . . .
As I mentioned before (many times :-)),I love to live in a different language for a couple of days. Have you ever experienced that someone answers in english (if I'm in Italy or Germany/Austria),saying "please,I would like to practise my english"? One of my favourites is Nobu and I always visit at least once Carluccio's. It is a chain now (but a good one, with excellent italian coffee-it is mentioned in Deborah Crombie's Garden of Lamentations),not expensive ,but when my son and I have first visited London,it was a proper,beautiful italian restaurant and we had our first dinner in London there. Thank you for sharing your wonderful travel journal! I'm a stationery geek--may I ask what notebook and pens you used? I am a Chicagoan; my accent is unfortunate, not cute. I wish. I keep it very simple now, just the Moleskine Cahier Journal (Kraft-brown cardboard cover, unlined pages), 5x8.25 in. and for that trip I was using my Lamy Safari fountain pen (Waterman Serenity Blue). Rude compatriots are such an embarrassment - I remember being on an overseas flight behind a couple who were truly appalling and making eye contact with one of my kids who afterwards commented that he heard me thinking "see, don't ever act like that". So I think there were educational advantages to their presence. I am a regular in our local pho place, and have at various times been asked to sample new dishes being auditioned and special things their small children have cooked (THAT was a challenge to gobble up appreciatively, let me tell you!). Oh, I'd love that pho! I travel alone most of the time, and I prefer countries where I speak the language. So I feel pretty safe in the English and Spanish speaking worlds, and I get by in Italian. My French embarrasses me, and Istanbul was quite a challenge. I feel uneasy in a country where I could not even read a newspaper. I feel the same way, "uneasy in a country where I could not even read a newspaper," although I'm not willing to eschew the opportunities for travel in such countries. I was so impressed at you taking on Turkish, not an easy language at all from what I've heard. I love people-watching in restaurants and it is always fascinating to see how a small minority of people appear to be oblivious of their impact on others. I remember many years ago when we took our then toddler daughter to a restaurant in rural Normandy (the only place to eat in the village) and we were mortified that she would not sit still for the duration of the meal, unlike her French counterparts who learn to eat out from the baby stage. To be fair, we could hardly ever afford to eat out at that stage in our lives, so our daughter had little experience of restaurants. However, we left as soon as we possibly could do so, to avoid disrupting everyone else's meals. I'm still fascinated by the differences between families and how laissez faire or strict some parents are with their small children (who are often beyond exhausted by the whole holiday experience). I can get by in basic French but I always wish my spoken French matched my understanding of what is being said by others. I get quite frustrated with myself when I understand a question but cannot articulate a reply without resorting to a series of single words! It's such a big difference, isn't it? I sometimes wish that I wasn't so conscious of other people's perception of me, but I also wish that some of the more obtuse could be a tad less solipsistic. . . Thanks so much, Wilma, for the kind words about my blog. Much appreciated. Charming stories, Frances! I think you did well to share your personal impressions of those moments. We're entitled to feel influenced by our experiences. Hubby and I (both Americans) also love to visit Paris, but neither of us speaks French. Unfortunately, Duolingo continues to assure me that I am 8% fluent in French, an ill-considered encouragement, since I have absolutely no business pretending I can speak the language! But despite our inability to make ourselves understood in French, we do know how to say bonjour, bon nuit, merci, pardon, etc. And we are happy folk, which probably translates easily. The great news is that, despite myths to the contrary, we have never been treated rudely by any Parisian. Honestly, I think it's due to my husband. For some reason, Parisians love him and noticeably so. He's a big, cool guy with a lot of self-confidence who's also kind and gentle. "High maintenance" he is not. He doesn't bother people with details. He just asks for what he wants (or points) and goes with the flow. As a result, he gets great service, and so do I when I'm with him. That's a good bucket list item! Lots of interesting comments and first of all, I admire your keeping of travel journals for so many years. When I have done it, I have found it to be such a time consuming project that I have endured it rather than enjoying it. One day in China I found that I had spent most a day in and writing up rather than being out and doing. I'm obviously overdoing it. I so admire those who can sit and capture a scene in a few strokes of whatever mark making implement comes to hand but I don't have that knack. I too have reading but not chipping in recently - my phone has a habit of swallowing up my comments and never regurgitating them onto the page (this is not a pleasant analogy, sorry) so I have to wait until I get to my laptop. I love the idea of all of your readers joined in their daily routines and pausing to catch up with your news. Re being foreigners in restaurants - yes, I think we have all cringed at others' behaviour. Surely it is not beyond anyone to learn hello, please and thank you in the country's language? Wendy's point about not having met overloud Americans in the US is a very interesting one. I would add overloud Brits in the UK too. Is this because we don't frequent the same places as the noisy ones when in the US/UK but somehow do when in Paris, Rome etc? That doesn't seem to make sense to me but perhaps we are all different when abroad? I have seen - and cringed - some stereotypical Americans abroad. One bunch, after assaulting our ears in a restaurant , got up and left to a French waiter's comment (meant for our ears, not theirs), "Go to Disneyland!" And there is the mystery, my daughter and I, both with very little French and bad accents, were somehow loved by almost all the waitstaff, locals, etc.- and I mean, we had waiters go out of their way to give us directions, taxi drivers show us back entrances, bring back an umbrella that I left in the taxi. We loved France- I hope not in an annoying, touristy way. We are always polite, and laid back, and loved the local restaurants, etc. (we did use some of your recommendations, for which I'm grateful). On the flip side of this, while traveling in Ireland, same language, everyone loves Ireland, right? We had an absolutely awful time, though the scenery was beautiful. I'm not sure it's such a mystery. I don't think the French particularly need people to speak their language, but they appreciate the efforts made to acknowledge the different culture, that it's their home and they're not just there to serve tourists. Good manners go a long way, always. . . I'm surprised about Ireland -- I was only there once, ever so long ago (I was 18!) and do hope to go back, knowing so many who, as you say, love it. Would you try again, do you think, or were you deterred enough that you'll stick to all the other great places there are to explore? We were in Ireland in July. It was perfect, the weather, the sights, the food, the people! We were so thrilled and delighted with every aspect of the country, sorry your experience was not as pleasant.